Is Lai Mohammed a comedian or a pathological liar? On Wednesday 3rd of May 2017, during a Federal Executive Council FEC meeting in Abuja which was presided over by the vice president of Nigeria, Professor Yemi Osibanjo, Muhammadu Buhari, the Nigeria president was noticed absent again. Meanwhile, briefing newsmen, Lai Mohammed said that Buhari is RESTING IN PEACE. He went further to say that Buhari’s doctors told him to rest in peace and that's what Buhari is doing as he wouldn't like to disobey his doctors. Oh my God! There is a very serious problem here which we will take time to buttress. In early March, while Buhari was away to London hospital for a medical checkup, an unconfirmed news went viral on social media platforms that Buhari is dead, but Buhari's aides kept telling Nigerians that their president Buhari is '' hale and hearty'', even when they claimed to have visited him at the London hospital where the president is, and even took photographs which they used as proof to their claims. However, be that as controversial as it turned out, a lot of Nigerians doubted the authenticity of the claims by Buhari's aides, but not until a built camouflaged image alighted from the aeroplane at the airport. Since then till today, nobody has ever seen Buhari, but we have been hearing that Buhari said this and Buhari said that without any video or audio clip to show that it is really the president that is speaking, and not a robot or a cabal in Aso Rock. Has Nigeria masked their president? What exactly do Lai Mohamed mean by saying that Buhari is Resting In Peace (R. I. P.). Its high time Nigerians learnt the true state of their president's health. Its obvious that the doctors might have told him to rest in peace, because they know too well where he is right now, but the Nigeria federal government under the umbrella of APC have hidden the main information about the president and continues to feed the gullible public with lies. We are not surprised neither are we worried, but we are a little bit happy because a great prophecy from Mazi Nnamdi Kanu in 2014 is about to be fulfilled. ''When i finished with Buhari, he will run to London and never come back again,'' although, Buhari himself steered the accomplishment when he said that he would rather die than to live and see Nnamdi Kanu released or allow for Nigeria breakup. Well if you ask us, we will tell you that Nigeria is not and has never been a nation, rather a contraption built on a solid rock of lies. Even the so called boko haram acclaimed leader, Abubakar Shekau surfaced anew and told the Nigeria soldiers and the APC government that he is still very much more healthier than their president Buhari. Since 2007 to 2016 and even till now, the soldiers according to themselves have killed Abubakar Shekau many times yet, he lives. That's simply because the contraption was embedded on a lying foundation. Whether dead or alive, we call on Nigerians to request for the whereabouts of their president or better still, invoke his impeachment processes, because an invisible person cannot rule over the living. Let all this lies from APC government and Lai Mohammed be exposed to the world. At this juncture, we are reminding Buhari that no matter where he is, Nnamdi Kanu whom he said that he will never allow to enjoy any form of freedom is out from the prison. We also call for the immediate release of Benjamin Madubugwu, David Nwawusi, Chidiebere Onwudiwe and other Biafrans detained unlawfully in various Nigeria prisons. 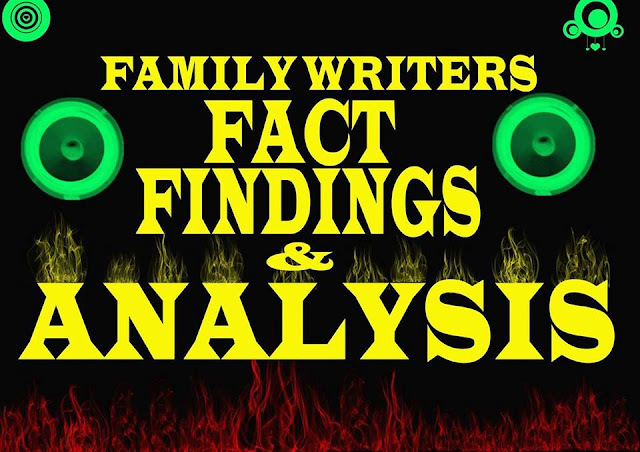 With this, we end this week's edition of Family Writers' Weekly Fact Findings And Analysis FWFFA. Remain blessed till we meet again next week. biafran should be carefull of the word restructure Nigeria. Biafrans let you people not be deceived again. there is no restructure all we need and we all stick together is independent state of Biafra. we have been deceived by the british, we have been deceived by the yourubas and we have been deceived by the hausa fulani but whom did the Biafrans deceived. Nigeria is dead and let the Biafrans go away. the Nigerians dont want the Biafrans rather they used them as instrument in developing their area, having free education, building two capitals Lagos and Abuja. seapoerts airports roads ... name it . i could remember in those days the imo airport was built by only collective offerings of individuals and nigerian government doesnt care about it.think of Biafran land Bakassi was given/ sold out to the cameroonians. where will i start and where will i end it up not mentioning of the effects and consequences of the civil war. All nigeria know is to kill Biafrans and take oil and the money from the oil with their British counterpart. Biafrans should be using media forum: internets, facebook, twiter, messages, text messages mobile phones in against the injustice of Nigeria and writing for the Biafran independence.